Car headrests were first mandated to be installed in vehicles back in the 1960’s. Headrests haven’t changed a lot since that time. They are typically supported by a post on each side of the headrest. These posts make an ideal mount point for tablets, phones and cameras. 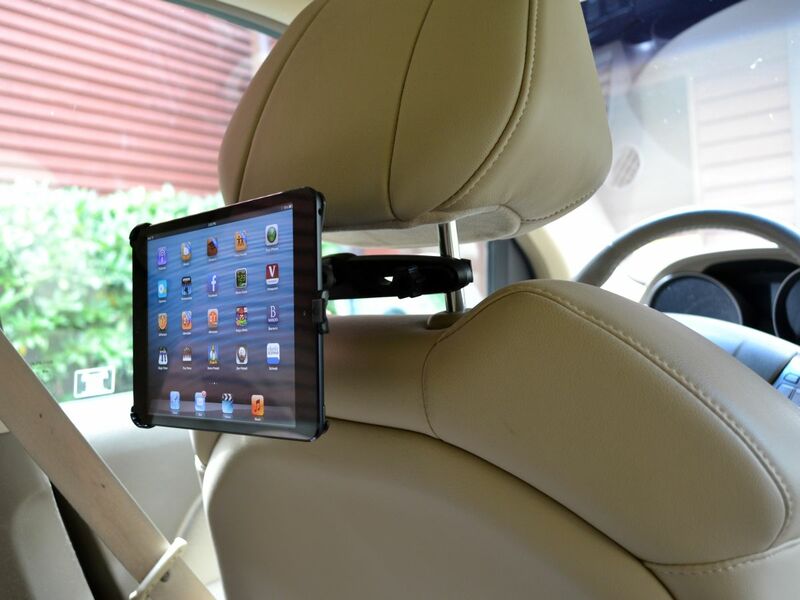 Car headrest mounts are especially useful for keeping backseat passengers entertained with your tablet. The posts to the headrest are typically the place where you would attach the mount. The headrest is also a great place to mount a camera for taking video of the views in front or behind the car. Let’s review some of the options. There are two kinds of car headrest mounts for tablets. The most common mount will attach to the two posts of a single seat and with the tablet placed between the posts. Perfect height for little backseat passengers and far enough away so that the tablet cannot be turned into a Frisbee. These mounts come in a wide array of qualities. There are lower end mounts that are made of plastic and include a universal cradle. I have found these mounts to be reliable but if you plan to install and remove it very frequently, consider a higher end headrest tablet mount such as those made by GripDaddy which include metal components and is a higher quality mount. You can also use your headrest to mount your large smartphone. The Arkon Midsize Tablet and Smartphone Car Mount is similar but include a smaller cradle to fit your large phone or small tablet. The included cradle opens to over 7 inches which is large enough for practically any phone with or without a case or skin. The basic car headrest mounts work well for a single passenger. Fights can ensure if you have more than one kid back there so for those families blessed with a larger family, consider the Arkon Center Extension Car Headrest Tablet Mount. This type of mount attaches to the headrest posts but then telescopes so that your tablet is located between the two front seats. No fights over who has the best angle to the tablet. Now the kids will just fight over what they are watching on the tablet. Maybe just buy a second headrest mount. These mounts are well made with the base constructed of a combination of metal and plastic. Dash cameras have increased in popularity dramatically over the past several years. The popularity is fueled by an affordable price and the emergence of the popularity of the GoPro series. A little used mounting concept for dash cameras is to use your car headrest. The advantage of using car headrest mounts for your camera is that most dash mounts are adhesive and when you sell your car, you will be faced with the dilemma of removing the mount without damaging your dashboard. Car headrest mounts are temporary and removable. You will need to select a mount that will attach to the post closest to the middle of your car and must include an extension to permit the camera to position between the seats with a clear view of the road. We have found the RAM Mount Handlebar U-Bolt Base w/Round 1/4″-20 Threaded Stud works well for this purpose. As long as your headrest post is at least .5 inches in diameter, these extremely well made mounts can be placed around the single post and positioned to view the road. Depending upon the clearance needed, you may need to add the RAM Ram Mount Long Double Socket Arm.